They were centuries ahead of their time... and paid a terrible price for it. 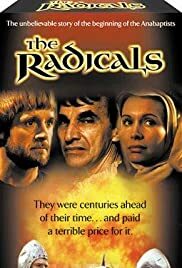 As a Mennonite, this has to be my favorite B-movie: appropriate for a simple-living faith! Apart from the geek-chic factor of the intimidating Eberhard Hoffman being played by Spock's dad, the film captures the emotional appeal of Anabaptism: an earnest desire for religion without worldly politics woven in, their temptation by and rejection of violence, the persecution from both Catholics and Protestants, the romance of simple living. I'm no film student, but I think the romance between Michael Satler and Margaretha is touchingly developed, and the dramatic opening sequence where Hans Blaurock and friends march through the snow to arrive just in time to try to stop an infant baptism adds an amusingly ironic touch of Hollywood.